This is gonna be a long one, lots to review and talk about… so grab a cup of tea and come straight back (milk and 2 sweeteners for me please). 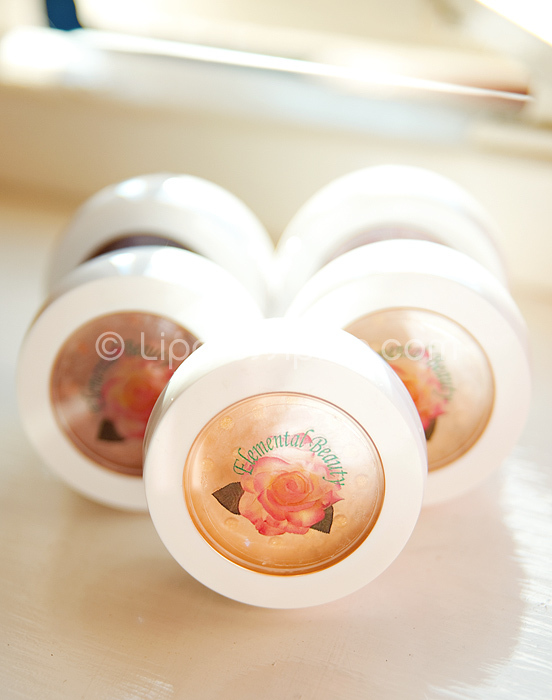 Elemental Beauty are a British brand of mineral makeup. I’m already a big fan of their mineral foundation. I generally struggle to find shades that are pale and cool toned enough to be a match for me, but I get great results using their shade “English Rose”. 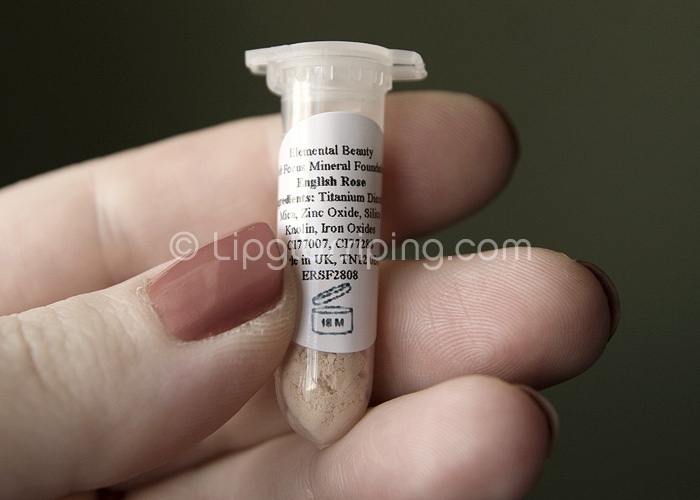 I had been wanting to feature a British mineral makeup brand on Lipglossiping for a little while. 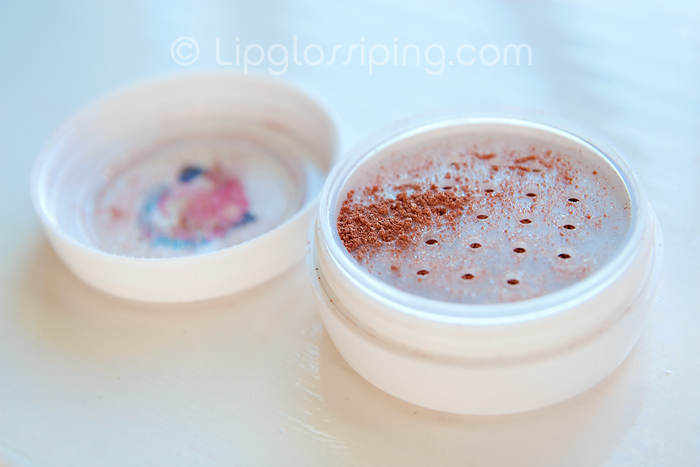 I do love US Brands for their teeny baggies of eyeshadows and blushes that they’re willing to send all over the world for not much more than the price of the stamp… butwhen I want something a little more subdued, a little more suitable for everyday wear… then I tend to look a little closer to home. I was pleased to receive some samples from Elemental Beauty and wanted to share my thoughts… Nicola at EB had been pre-warned that if I didn’t like something… I was gonna tell it like I saw it and to her credit – she was still completely game. Confidence in your own products is something that told me I probably wouldn’t be too disappointed – and I was right! Very shabby chic, but um without the shabby. I’d first heard of Elemental Beauty on the forums of MoneySavingExpert, where many forum-ites hold the soft-focus and healing foundations in extremely high regard. The holes are quite large, so I have to be careful when opening the jar as a lot of product is usually sitting ontop of the sifter and if I travel, I’d definitely have to sellotape over the holes. But… I also hate sifters where the holes are so small it takes half an hour to tap out any product (The She Space sifters drive me to extreme frustrations). I think I do prefer the bigger holes but they don’t come without that caveat. 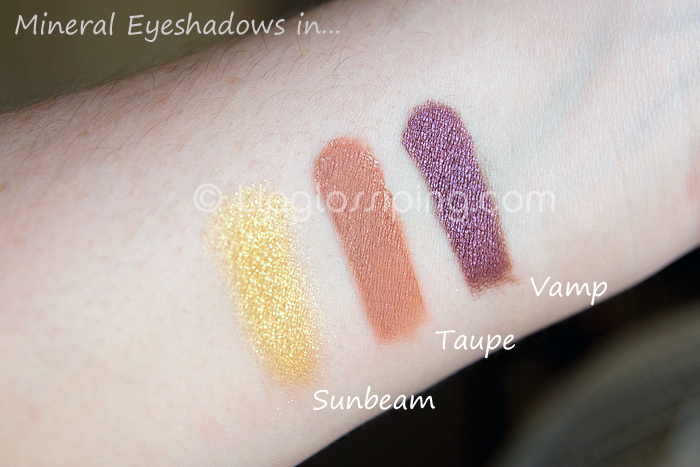 I received three of these eyeshadows in shades: Sunbeam, Taupe and Vamp. 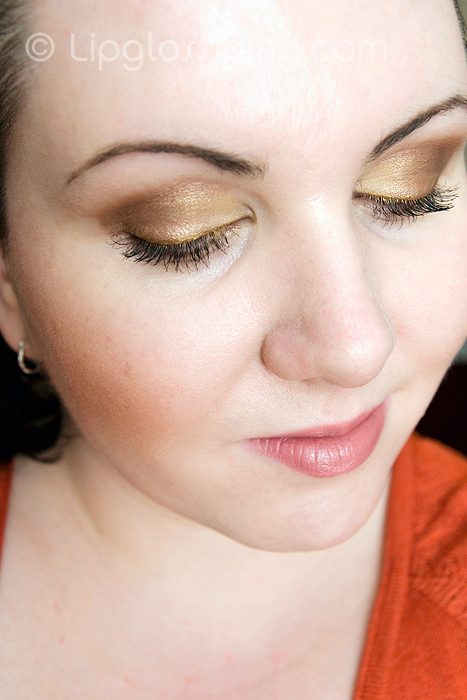 Here’s a swatch of how they looked foiled (applied with a wet brush) on my skin. Taupe for me, is the problem child. 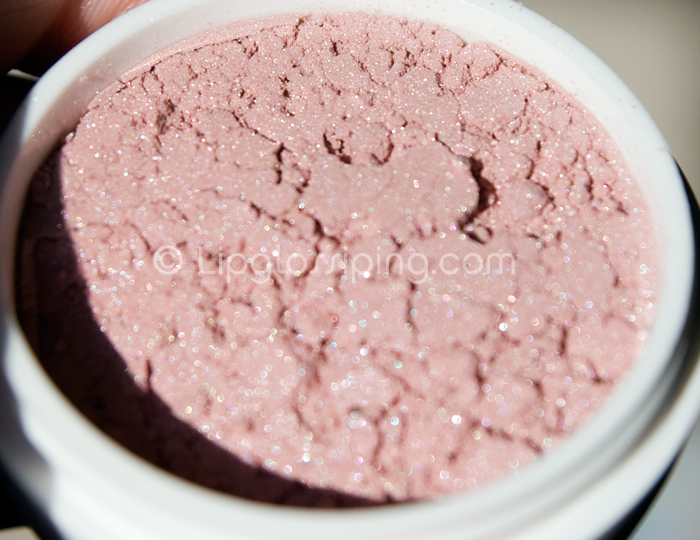 It’s described as “softly sparkling” which I’d agree with although compared to the other two it looks positively matte! What I’m not keen on is the name. 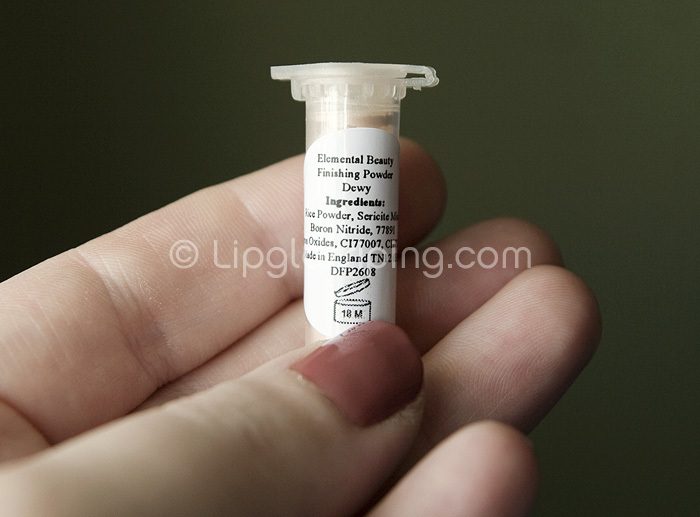 If I ever created my own line of cosmetics I would completely eschew the word taupe from my colour descriptions! It’s overused… and doesn’t have any set definition or benchmark. 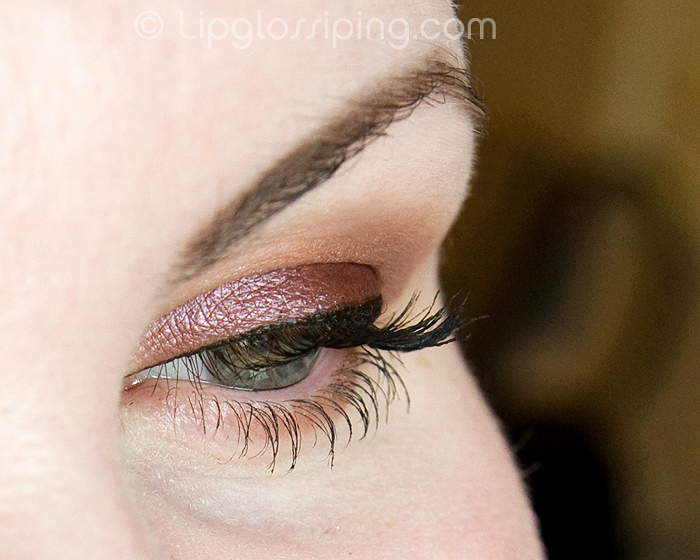 Now when taupe is done (in my subjective opinion) right… I adore it. for me, taupe should be a mid-toned mix of grey and brown and if it has a little shimmer or metallic edge to lift it from drabness, then even better! I freakin’ love Sunbeam. A perfect pale gold with a spectacular amount of micro sparkle which somehow manages to stop short of looking like a glitter bomb has exploded in my face. So far, I’ve used this with great success as an all-over lid colour (foiled), a highlight under the brow (dry) and a highlight near the tear ducts (foiled). It’s beautiful and really lifts my complexion. Vamp is a tricky one… it looks like an out and out purple from my swatch no? But let me show you something…. This is Vamp foiled on the lid… the red-undertones in the shadow are far more apparent here than the metallic purple shown in the swatch. It’s a colour shifting-shadow! Great! But I fell in love with the metallic purple in the swatch! Gimme back that vibrant purple! The above 2 images show Sunbeam on the lid with Vamp in the crease. See how lovely Sunbeam is? Again, Vamp looks more red-brown than purple. 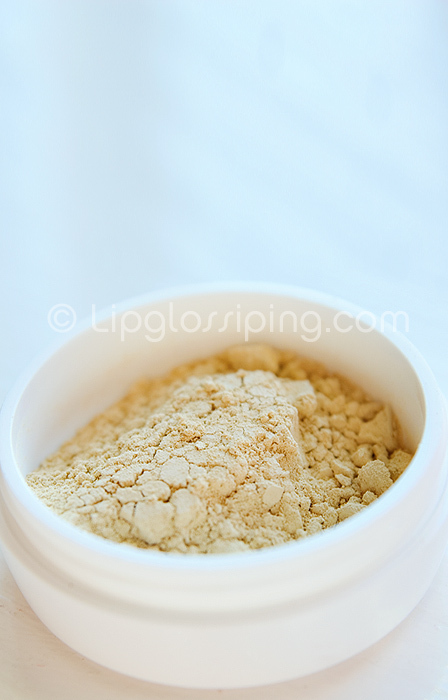 I have no issues with pigmentation and the product is nicely milled which ensures a smooth, even application. This is the Illuminator in Rosy Apple. I wanted to capture the micro-sparkles, so although the above photo isn’t the best. I think it demonstrates them clearly! They’re fine and not at all chunky. A little goes a long way! I apply this to my cheekbones (avoiding the apple of the cheek) and I have found that using a loose bristled brush or fan brush is perfect for a rosy glow. 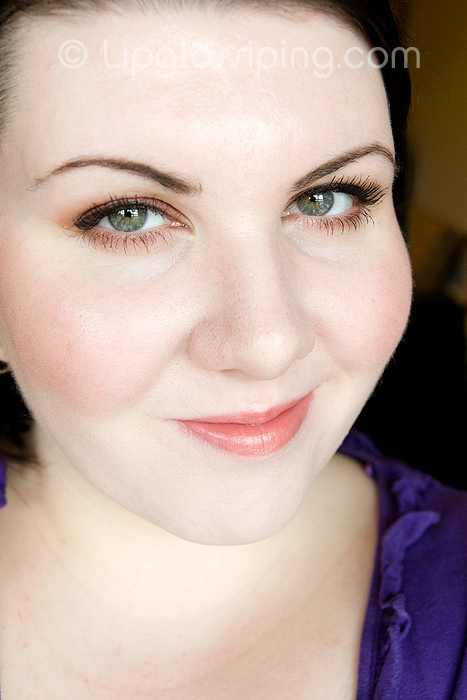 Above: Illuminator in Rosy Apple, Vamp on lids, Taupe in crease. 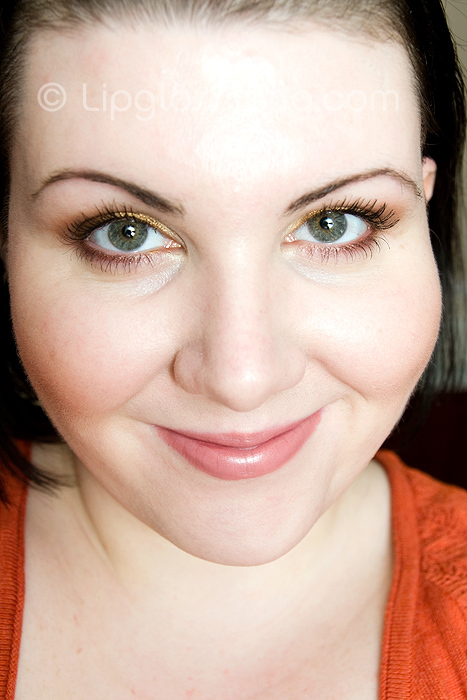 A pale yellow concealer to conceal dark circles and give you a wide awake look! 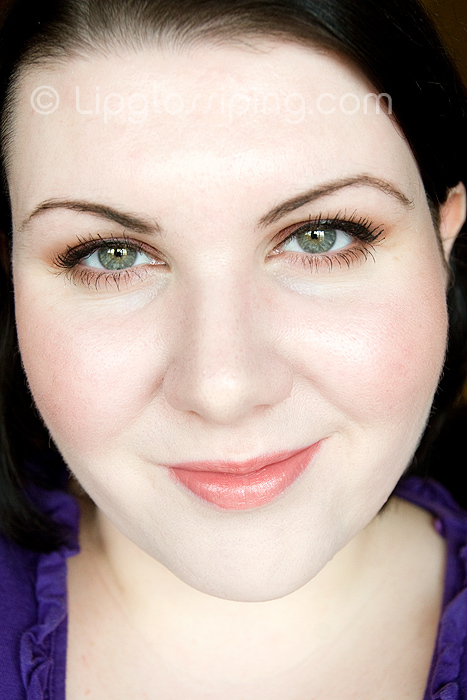 Bright eyes can also be used as a blemish concealer for very pale skin tones. I’ve been mixing this with a tiny amount of my Body Shop Vitamin E Serum to create a fairly thick paste (you only need the tiniest amount of both products). Then I’ve been patting it with my ring finger all over the eye area. 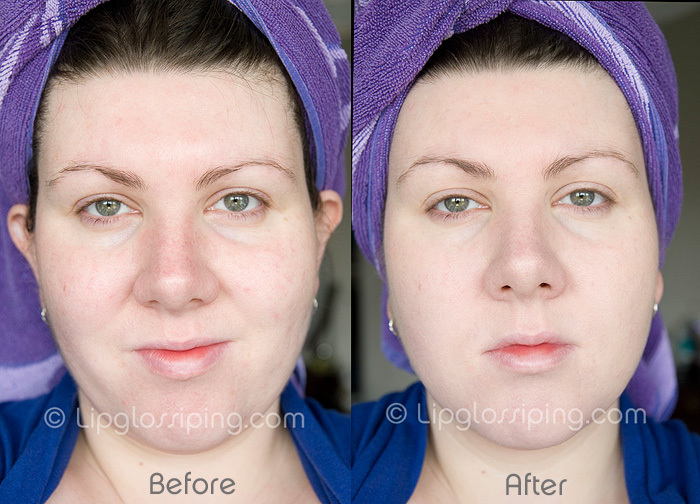 It really gives the whole area a lift and makes my eyes look brighter and fresher. I also love the even base it creates on my eyelids for days when I just want to wear a slick of eyeliner and mascara. I’ll be doing a further review with application pictures on this soon. All EB products are Bismuth Free which is essential for me as Bismuth makes my face itch. Nicola at EB has assured me that they create and custom blend all of their shades in-house. I thought that was worth clarifying due to recent revelations of a certain mineral makeup company repackaging wholesale shades without declaring that they’re not custom blended. “As we are a manufacturer, we are able to offer a bespoke service providing custom foundation shades for any of our customers that are struggling to find their perfect match in our standard shade range. Shades to complement a special outfit? Awesome. 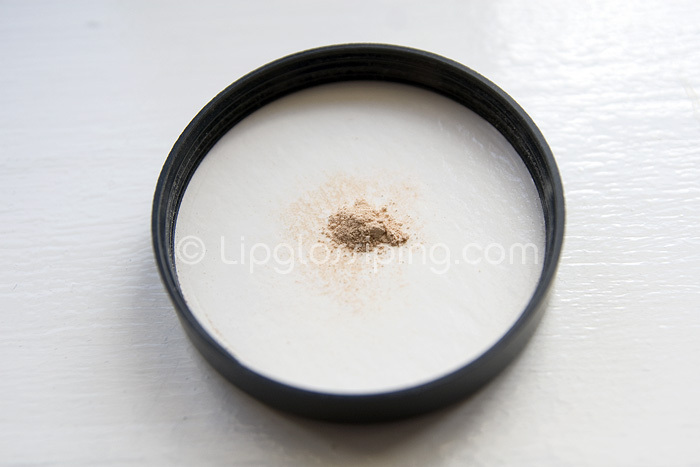 Which I think is pretty decent service as shade selection from online mineral makeup selections often involves a leap of faith, I should know… I have binned many orange mineral foundations from bad choices! 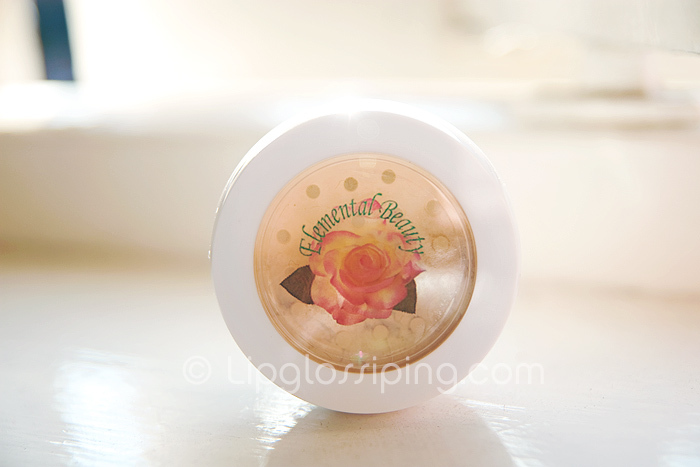 Have you tried Elemental Beauty? 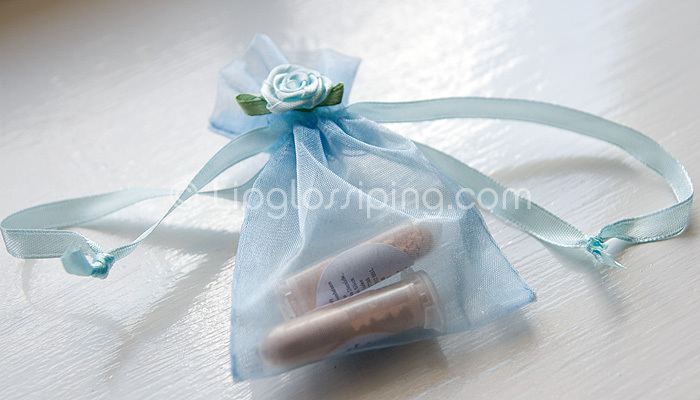 What do you look for in a mineral makeup company? Like what you see here? Need a lie down after that mammoth review? (I know I do! ).